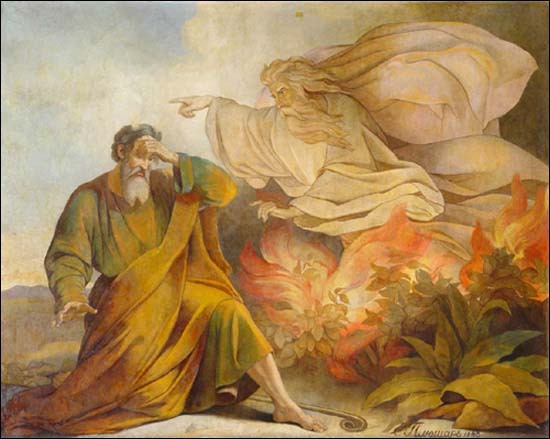 Eugene Pluchart (French painter, 1809-1880), "God Appears to Moses in Burning Bush" (1848), St. Isaac of Dalmatia Cathedral, St. Petersburg. Larger image. One aspect of God's nature that fascinates and comforts us is his eternity. In this chapter we'll examine God's self-revealed name -- Yahweh, I AM THAT I AM. We'll also consider a number of names that indicate God's eternal nature -- Eternal/Everlasting God (´El `Olam); Ancient of Days; Alpha and Omega; the First and the Last; the King eternal, immortal, invisible; the Living God; the One Who Inhabits Eternity; and the One Who Lives Forever. Let's begin by hearing God's revelation of his name to Moses at the Burning Bush. 1Now Moses was tending the flock of Jethro his father-in-law, the priest of Midian, and he led the flock to the far side of the desert and came to Horeb, the mountain of God. 2There the angel of the LORD appeared to him in flames of fire from within a bush. Moses saw that though the bush was on fire it did not burn up. 3So Moses thought, "I will go over and see this strange sight -- why the bush does not burn up." 4When the LORD saw that he had gone over to look, God called to him from within the bush, "Moses! Moses!" 5"Do not come any closer," God said. "Take off your sandals, for the place where you are standing is holy ground." 6Then he said, "I am the God of your father, the God of Abraham, the God of Isaac and the God of Jacob." At this, Moses hid his face, because he was afraid to look at God. 7The LORD said, "I have indeed seen the misery of my people in Egypt. I have heard them crying out because of their slave drivers, and I am concerned about their suffering. 8So I have come down to rescue them from the hand of the Egyptians and to bring them up out of that land into a good and spacious land, a land flowing with milk and honey -- the home of the Canaanites, Hittites, Amorites, Perizzites, Hivites and Jebusites. 9And now the cry of the Israelites has reached me, and I have seen the way the Egyptians are oppressing them. 10So now, go. I am sending you to Pharaoh to bring my people the Israelites out of Egypt." 11But Moses said to God, "Who am I, that I should go to Pharaoh and bring the Israelites out of Egypt?" 12And God said, "I will be with you. And this will be the sign to you that it is I who have sent you: When you have brought the people out of Egypt, you will worship God on this mountain." 13Moses said to God, "Suppose I go to the Israelites and say to them, 'The God of your fathers has sent me to you,' and they ask me, 'What is his name?' Then what shall I tell them?" 14God said to Moses, "I AM WHO I AM. This is what you are to say to the Israelites: 'I AM has sent me to you.'" 15God also said to Moses, "Say to the Israelites, 'The LORD, the God of your fathers -- the God of Abraham, the God of Isaac and the God of Jacob -- has sent me to you.' This is my name forever, the name by which I am to be remembered from generation to generation. Moses, as you will recall, was saved as a baby from death by exposure by being adopted by Pharaoh's daughter. He was educated in the palace and raised as a noble. When he was about 40, he sought to help his fellow Israelites by killing an Egyptian. For that he had to flee into exile. He had an education, but he didn't know God. Now about 40 years after fleeing Egypt, Moses is an old man of 80. No longer a prince of Egypt, he tends sheep, a menial task by Egyptian standards (Genesis 46:34). And not even his own sheep, but those of his father-in-law Jethro, "the priest of Midian." As he leads the sheep to pasture in this dry land, Moses travels to Horeb, "the mountain of God," that is, where God will reveal himself to the people of Israel a few years hence. "Horeb" means "desert, waste," signifying a desolate region, and seems to be an alternate name for Mount Sinai.1 The narrator calls it the "far side," "backside" (KJV) of the desert or "beyond" the wilderness (NRSV).2 It was very remote, far from Moses' normal dwelling. God tells Moses that he has seen the misery of "my people" and states his intention to rescue (nāstal)7 them and bring them back to Canaan. He concludes, "So now, go. I am sending you to Pharaoh to bring my people the Israelites out of Egypt" (3:10). Now Moses begins to protest. His first objection is that he is a nobody. God's answer to the excuse of being a nobody, is that a Somebody will be with him. Moses' second objection seems strange -- that if he doesn't know God's name then he won't have any authority with the people. "He who is," the "Self-Existent One"
"He who will continue to be (present with his people). But the idea of eternity is clearly present also. Since the idea of "to be" can refer to God's indefinite existence in the past, present, and future, we see in the Book of Revelation: "'I am the Alpha and the Omega," says the Lord God, 'who is, and who was, and who is to come, the Almighty.'" Jesus' audacious claim to the Pharisees clearly uses the "I AM" statement in a striking way: "'I tell you the truth,' Jesus answered, 'before Abraham was born, I am!'" (John 8:58). They were so offended by his assertion and use of the Divine Name they picked up stones to stone him. It is quite clear that this verb hāyā ("to be") is intended to be understood as part of the Lord's name. That is what the revelation to Moses is all about. The likelihood is that this similarity between words was paronomasia, a play on words, more than a scientific etymology or derivation of the name. Nevertheless it is very relevant to understanding this new revelation of Yahweh.13 Clearly in this revelation to Moses, God intends us to know him as the great I AM, the One Who Is, the One Who Will Always Be. Q1. (Exodus 3:1-15) What does God's name Yahweh reveal about his person and his power? How would an understanding of Yahweh's name contrast him with the idols worshipped by the Egyptians? It has become apparent through biblical studies in the twentieth century that the correct pronunciation and spelling of God's name should be Yahweh rather than the traditional Jehovah. For greater detail on this, see the sidebar, "Correct Spelling and Pronunciation of Yahweh vs. Jehovah" (www.jesuswalk.com/names-god/yahweh_jehovah.htm). Even though the early Israelites no doubt pronounced the divine name Yahweh, as the pre-Christian era drew to a close, there was a strong movement among devout Jews to avoid pronouncing the Divine Name at all, lest they misuse it and break the commandment: "You shall not misuse the name of the LORD [Yahweh] your God, for the LORD will not hold anyone guiltless who misuses his name" (Exodus 20:7; Deuteronomy 6:11). Their avoidance even extended to reading the divine name from Scripture in the synagogue. It became the custom in the synagogue that when the reader came to YHWH, he would read it as Adonai ("Lord"). American Standard Version (Thomas Nelson & Sons, 1901) uses "Jehovah" whenever the divine name occurs, a difference from the closely-related English Revised version (1885). For many years the American Standard Version was used, published, and distributed by the Jehovah's Witnesses because of its use of Jehovah for the divine name. New World Translation of the Holy Scriptures (Watch Tower Bible and Tract Society of New York [Jehovah's Witnesses], 1961, revised 1970, 1984) uses Jehovah whenever the divine name occurs. The Jerusalem Bible (Doubleday, 1966) and the New Jerusalem Bible (1988) use Yahweh whenever the divine name occurs. and the king of glory shall enter! Occasionally God's name appears in shortened form as Yāh (Exodus 15:2; 17:16). The divine name appears in "Hallelujah" used in Revelation 19:1, 3, 4, and 6, which is transliterated from two Hebrew words commonly found in the Psalms (Psalm 104:35, etc. ): halelu ("praise ye"), from hālal, "praise, boast") and Yāh (a shortened form of "Yahweh"). Of course, many names are compounded from the generic name of God, as well, such as: Elijah, Elisha, Joel, Eli, Nathaniel, Elimelech, Elizabeth, Michael, and many others. When Was the Name Yahweh First Used? Yahweh is found about 160 times in Genesis, often in voice of the narrator. Some of this might be considered an anachronism, using later language to explain earlier events, since Genesis probably wasn't written down until Moses' time or later -- after God had revealed himself to Moses by the name Yahweh. But the name Yahweh is occasionally pronounced by the patriarchs themselves (e.g. Genesis 14:22; 15:2, 7-8; 16:2, 5; etc.) and appears as part of a few personal names of the period prior to God's revelation to Moses in the burning bush (such as: Beriah and Jochebed, Moses' mother). Liberal scholarship beginning with Julius Wellhausen (1844-1918) seized on this and other apparent discrepancies and anachronisms as the basis of his elaborate Documentary Hypothesis. The theory speculates that the work of four editors was spliced together to form the Pentateuch as we have it today. Where God's name is given as Yahweh, the Yahwist editor (J) was the author. Where God's name is given as El, the theory goes, the Eloist (E) author is assumed, and so on. While in the twentieth century this was the dominant theory of authorship among more liberal scholars, these days it has pretty much fallen into disrepute since designation of the various strands is so speculative and varies from one scholar to another. Certainly editors helped form the Pentateuch as we have it today, but it is extremely doubtful that their work can be explained by the Documentary Hypothesis. We've spent considerable time exploring God's name Yahweh -- and rightly so, since it is by far the most-used name, title, or descriptor of God in the Bible, used about 6,800 times in the Old Testament, with ´El second with 2,600 uses. But this is not a name popularity contest, but a quest to know God by his names, titles, and metaphors used to describe him in Scripture. "For thus says the high and lofty one who inhabits eternity (`ad), whose name is Holy..." (Isaiah 57:15, RSV). Meditate on this a moment. What does it mean to inhabit perpetuity? Never ending, never changing time? If time can ever be any real measure of eternity. God inhabits a different plane than we do. Q2. (Isaiah 57:15) What do you think it is like to "inhabit eternity"? What will it be like when you inhabit eternity with the Eternal God, seated with Christ Jesus in heavenly places? What emotions does this inspire in you? The Ancient of Days is obviously a vision of God, something like Revelation 20 and the Messiah is the Son of Man who appears before God on the clouds of heaven. This part of Daniel is written in Aramaic, a close cousin of Biblical Hebrew. The word translated "ancient" is the Aramaic adjective `attîq, "advanced, aged," as to days or years,21 "very old. "22 While the figure is one of old age, God's eternal nature is clearly suggested. Meditate on the figure of the Ancient of Days. What would it be like to sit at his feet quietly and learn from his wisdom. Why don't we take the time to do that more? However, in two verses close by there is also an emphasis on exclusivity. Yahweh is the first God and the last one too. There is no other god but he. Q3. (Isaiah 44:6; Revelation 1:8) What does the idea of "first" and "last" tell you about God? How does Revelation 1:8 relate to God's revelation to Moses, "I AM THAT I AM"? He is the Living God. If the key verb for Yahweh is hāyā, "to be," then the key verb for the Living God is chāyā, "live, have life, remain alive, sustain life, live prosperously, live forever." Also "be quickened, revive from sickness, discouragement, or even death." The related adjective is chay, "living. "23 Again and again we see God in the dynamic descriptor of the Living God beginning in the Pentateuch and continuing through the New Testament. David's heart longs for the reality and soul-quenching experience of knowing God -- the God of life, the God who is alive forever. Q4. (1 Samuel 17:26, 36; Hebrews 10:31) How do you think David's understanding of the Living God enabled him to challenge Goliath? Read Hebrews 10:31 in context. Why should the Living God inspire fear and dread? We are finite. But by God's grace through Jesus Christ we are connected to Yahweh, the Eternal God. Our faith link to the Living God brings us the eternal life that ever flows from him. What a wonderful privilege we have, that the Eternal God has made himself known to us and longs for us to know him! Lord, what an incredible privilege we have to know you. And to have crossed the bridge from the limitations of our own mortality to the limitlessness of your eternal life. Thank you. Let us live with the perspective of eternity so that our moments here on earth count for your eternal purposes. In Jesus' name, we pray. Amen. "Like a River Glorious" (... "Stayed upon Jehovah..."), words by Frances R. Havergal (1874), music by James Mountain (1876). "The God of Abraham Praise," words are from the Yigdal of Daniel ben Judah (1404), paraphrased by Thomas Olivers (1770), music is Hebrew melody from the 18th century. BDB p. 352; Edwin Yamauchi, ḥārēb, TWOT #731c. ´Ahar is a common word meaning, "after, behind" (of place). R. Laird Harris, ´āhar, TWOT #68b. Gādōl, "great," is used of intensified concepts like loudness in sound, being old in years, great in importance. Elmer B. Smick, gādal, TWOT #315d. Mal´āk means "messenger, representative." The "angel of the Lord" ... "seems to be God, since those who see him marvel that they have seen God (Judges 13:21-22) and he speaks for God in the first person (Genesis 16:10; Exodus 3:2, 6; Judges 2:1)." (Andrew Bowling, l´k, TWOT #1068a). We're not sure of the botanical identification of the bush (also in Deuteronomy 33:16). It seems to be "a thorny" bush, perhaps a black-berry bush" (BDB 702). Brevard S. Childs, The Book of Exodus: A Critical, Theological Commentary (Old Testament Library; Westminster Press, 1974), p. 79. Nāstal means "deliver, rescue, save" and is used many times in the Bible of God's redemption of Israel when they were in trouble. R. Alan Cole, Exodus (Tyndale Old Testament Commentaries; InterVarsity Press, 1973), p. 69. C.F. Keil, in Keil and Delitzsch, in loc. Albright and other suggest a slight emendation of the Hebrew text from the Qal stem, "to be," to the Hiphil stem, which carries the causative idea, "to cause to be." If you were to accept this theory, God would be saying, "I cause to be whom I cause to be," that is, a revelation of the Creator. However, since the there is no known example of this verb in the Hiphil and the context of the passage doesn't talk about God as Creator, but the God's role as the redeeming, covenant God, the Qal stem is preferred. (So Christopher J. H. Wright, "God, Names of," ISBE 2:507 and Victor P. Hamilton, hāyā, TWOT #491. On the other view David W. Baker, DOTP 362.). J. Barton Payne, hāwā, TWOT #484a. Douglas Stuart, "Names, Proper," ISBE 3:483-488. Payne, hāwā, TWOT #484a. Payne cites J.A. Moyter, The Revelation of the Divine Name (Westminster Press, 1965), pp. 11ff. So Roland Kenneth Harrison, Introduction to the Old Testament (Eerdmans, 1969), p. 400. Wright, "God, Names of," ISBE 2:507. On this point he cites Edmond Jacob, Theology of the Old Testament (Eng. translation 1958), pp. 49f. Allan A. MacRae, `lm, TWOT #1631a. Qedem here refers to "ancient time, aforetime." In poetic passages qedem describes the created state (Leonard J. Coppes, qādam, TWOT #1988a; BDB 869, 2a). Elmer B. Smick, chāyā, TWOT #644. The phrase is found in the Old Testament in two forms: ´elôhîm chayyîm and ´el chay, with no discernable difference in meaning and usage between them. Marten H. Woudstra, The Book of Joshua (New International Commentary on the Old Testament; Eerdmans, 1981), p. 84. In a fascinating chapter from In Search of God, as an answer to Swedish theologian Geo Widengren, Mettinger contends that the term "Living God" is used in contrast to the Canaanite myth of the dying and rising god, that died with the scorching heat of summer and revived with the cool rainy season. Living God appears 13 times in the Hebrew Old Testament and two times in the Aramaic section of Daniel. The Old Testament oath formulas, "as the LORD lives" occur 67 times in the Old Testament. On 23 occasions, God swears by himself, that is, "as I live...." (Tryggve N. D. Mettinger, Frederick H. Cryer (translator), In Search of God: The Meaning and Message of the Everlasting Names (Philadelphia: Fortress Press, 1988)).